HDT’s Adroit manipulator arms can be assembled in a wide range of Degrees of Freedom (DoF), lengths, and lift capacities, simply by connecting together modular Adroit actuators in different configurations. The Adroit arm shown above has eight DoF, not including the end effector. In a basic six DoF arm configuration, including a 10 DoF end effector, the arm weighs about 7 kg (15 pounds) and can lift approximately 23 kg (50 pounds). HDT’s Adroit actuator has true force sensing and absolute position sensing. The internal control loop in each actuator runs at 500 Hz, providing smooth motion and very effective impedance control. HDT’s undersea version of the manipulator arm has even greater corrosion resistance and stronger seals. All versions of the arm meet IP-67, as well as MIL-STD 810G, 461E, and 464C. Adroit arms can be commanded joint-by-joint or in end-point mode. The end-point can by dynamically assigned to different locations and orientations (generally within the end-effector). Several operating modes command the arm position, speed, and force. Every operating mode can work with variable impedance, or no impedance. By using impedance control to create mechanical compliance, the arm is safe to operate around people, without requiring safety barriers. 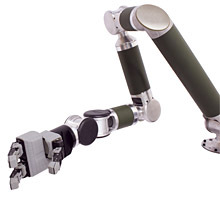 You can see videos of the Adroit Manipulator Arms in action on our video page.